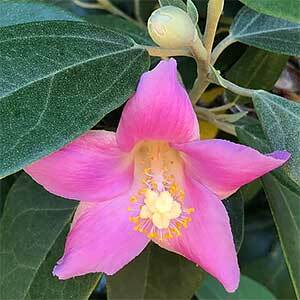 This is an upright tree and commonly called the Norfolk Island Hibiscus, Lagunaria patersonia with its attractive deep green foliage also has pink flowers in profusion from summer right through until autumn. It can be grown as a tree, or pruned as an evergreen hedge and is widely used as a street tree in many areas. Growing well in coastal conditions it is used for its easy care growth habit. Once established this is very easy care tree. It requires little pruning and will survive long dry summers. It is a pity such an attractive easy care tree has one major problem. After flowering the seed pods that form on the tree develop fine hairs, and these can cause a range of allergic reactions. The common name of Cow Itch Tree, perhaps gives away the main issue. So from St Kilda to Warnambool to Brisbane, local residents have at time to have these trees removed. Common Name – Norfolk Island Hibiscus, Cow Itch Tree, Itchy Powder Tree. Fruit – Rounded and purple with white flesh around 6cm in diameter..